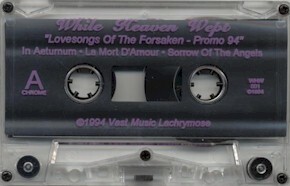 The origins of WHILE HEAVEN WEPT lay in the act DREAM WYTCH, forged in November of 1989 by erstwhile POLARIS guitarists Chris Galvan and Tom Phillips. Between 1990 and 1993 DREAM WYTCH was afflicted by unceasing line up changes culminating in Tom Phillips remaining as sole founder member. 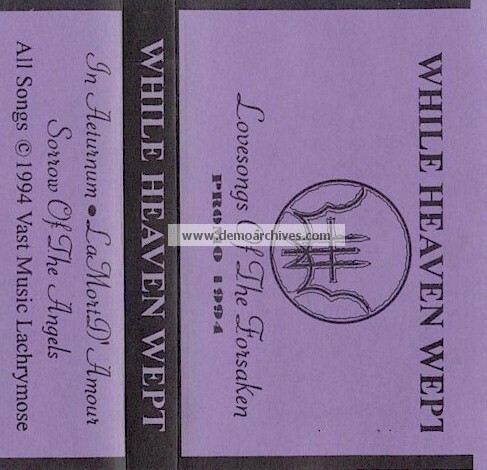 This pivotal moment of change within the band was to coincide with a number of personal tragedies in the musician’s life and so a new band title of WHILE HEAVEN WEPT was adopted. In late 1993 bass player Gabe Funston and drummer Jon Paquin were enrolled and in January of the following year recording sessions took place which yielded the limited edition ‘Into The Wells Of Sorrow’ 7” single for the Open Eye label, material for a split single with Californians COLD MOURNING and a 1994 promo. This promo was turned into an EP ‘Lovesongs Of The Foresaken’. Despite this very tangible solid progress Funston decamped in April of 1995. WHILE HEAVEN WEPT regrouped by drawing in former GREY DIVISION BLUE musicians guitarist Kevin Hufnagel, also of THE FIFTH SEASON, along with viola and bass player D. Clayton 'Varsalin' Ingerson. This revised version of the band retired to Neptune Studios in the Autumn of 1995, home of the band’s previous sessions, to record the album ‘Sorrow Of The Angels’. WHILE HEAVEN WEPT went on temporary hiatus and Phillips kept active, lending guest vocals to demos for TWISTED TOWER DIRE and joining the British underground Doom band SOLSTICE as frontman. 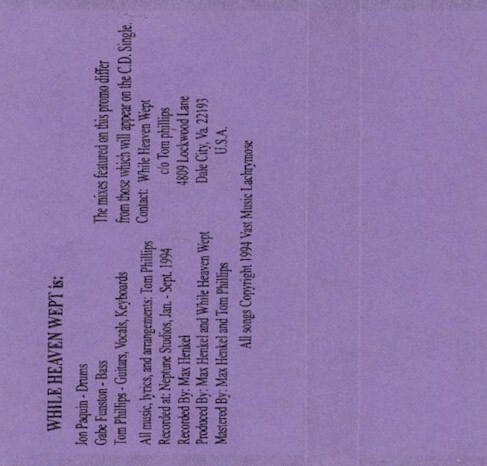 Purple xerox copied covers which were printed onto heavy cardstock paper. No lyrics. Pro made tapes. These songs are different compared to the 1995 EP of the same title.